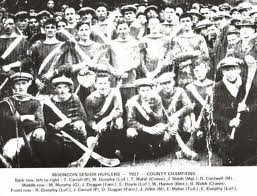 Kilkenny hurling team, All Ireland champions 1927. The GAA saw itself as the true representative of the Irish nation at play. Barry Sheppard investigates how it fared in the early years of Irish independence. See also his articles on the Rathcairn Gaeltacht and the Gaelic League. From the earliest part of its history, the G.A.A. had been closely associated with both constitutional nationalism and advanced nationalism. Where did the Association now find itself in the new independent state and did it now assume that a native government could be entrusted with the task of advancing the interests of native sports in the area under its control? How was the Association affected by the transition from conflict to relative peace and a degree of independence? What was the relationship between the Association and the Free State governments and did this relationship change over time? Did the Association, because of its role in pre-Independent Ireland enjoy a degree of privilege in the new state? From its foundation time spokesmen of the Association had continually asserted that the G.A.A. was something more than a sporting organisation; might it now safely become merely a sports body? In order to answer these questions this article will examine what role the Association had in the new state. It will look at the relationship the top officials of the Association had with members of the Government. It will also look at how the Association adapted to surviving in a conflict situation to one of peace and increasing normalisation. The political transformation effected by the Anglo-Irish Treaty of 1921 provided the G.A.A. with a number of unprecedented problems for which it was quite unprepared. This was mainly due to severe disruption of the Association’s activities during the previous years of conflict, and the Treaty split itself. Prior to the Treaty the Association was in a weak financial position, resulting in the Dáil Government in late 1920/early 1921 agreeing to pay off the Association’s £1,700 debt and facilitating the loan of a further £6,000. It has been suggested the events during the War of Independence, most notably Bloody Sunday, 21 November 1920 may have actually strengthened the G.A.A.’s hand in their negotiating financial assistance from the Dáil Government because now, as a result of the massacre on its grounds, the G.A.A. was now fully written into the national struggle. Given the Association’s financial position in the early 1920s and the fact that the dominating personalities on the Association’s Central Council were supporters of the Treaty, a policy of close cooperation with the first Free State government under WT Cosgrave may have seemed a wise course of action. Good relations between the Association and the new Cumann na nGaedheal Government would be necessary to successfully promote the new State’s showpiece sports event, the Tailteann Games (See The Irish Story’s article on this event here). Although this landmark event was not strictly a G.A.A. endeavour, it did demonstrate the first significant cooperation between the G.A.A. and a native Irish government. And its importance to the G.A.A. is illustrated by the senior G.A.A. staff who worked with the Government in promoting it. 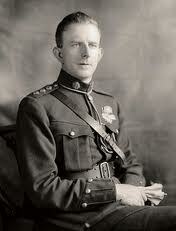 Minister for Posts and Telegraphs and one time Cork G.A.A. Board member J.J Walsh was placed in charge of planning the games. Walsh gathered around him the cream of the Associations best organisers, J.J. Keane, Jack Shouldice and Luke O’ Toole. Despite the success of the games, in particular the first two, the relationship was beset by arguments over money and disagreements resulting from the Civil War, in particular the issue of the continued detention of prisoners. The continued detention of prisoners not only threatened the Tailteann games it also had repercussions for the smooth running of regular Gaelic games and resulted in some G.A.A. protests with footballers and hurlers refusing to play in the finals of All-Ireland Championships. In June 1923 Kerry refused to play Dublin in the All Ireland Final because of the imprisonment of Austin Stack, anti-treaty figure and president of the Kerry Board. Limerick refused to play Galway in the 1923 All Ireland hurling final and Cork refused to play Offaly in the junior hurling final due to the continued imprisonment of Sean McCarthy and others. Some republicans even tried to enlist the G.A.A. in the struggle against the new Free State. Just as the I.R.B. had, ‘won control of the central organisation of the G.A.A. in the 1880s’, the I.R.A. leadership felt that if they could gain control of the G.A.A. it could severely embarrass the Free State by organising a complete boycott of the Tailteann Games. It was always going to be difficult for Cumann na nGaedheal to maintain the loyalty of all G.A.A. members because the civil war had made inroads into the unity of the Association. However these boycotts inflicted limited disruption as they were confined to a few counties. In fact, the G.A.A. played a significant role in helping mend the divisions caused by the civil war. When we first saw the official announcement of General Eoin O’Duffy as Chief of Garda Síochána, the one thing we felt certain of was that Ireland’s native sports and pastimes would have a new influential factor in An Garda….he is of the class and character of the men whose work has been of the stamp which has given the Association that prestige and stability which have enabled it to live down all the opposition that has spent itself in a fruitless effort to submerge it’. The Gaelic Athletic Association was, by 1927, the only sporting organisation in the Free State that did not have to pay taxes. O’Duffy was chosen to head negotiations with the Department of Finance to ensure a favourable outcome for the Association in relation to the payment of tax duties. At this meeting it was noted that the Minister for Finance received them in, ‘a sympathetic manner, as a Gael should meet Gaels’. The negotiations surrounding the Finance Act of 1927 were not the first time the G.A.A. had to deal with authorities in relation to the payment of tax. The Association had refused to give into demands by British officials to pay an entertainment tax in 1916. This obstinate stance became their justification for the refusal to pay taxes in the future. In 1922 the Government ordered the G.A.A. to pay their share of income tax but this was refused on the basis of their stance in 1916. With the passing of the Finance Act of 1925, the G.A.A. had initially been placed in a privileged position of exemption. Witnessing the favourable treatment the G.A.A. had been given by the government other sports such as soccer and rugby also agitated for exemption under this particular Finance Act. The G.A.A. however, believed that it alone was entitled to exemption based on its national role over the previous several years. Some within the G.A.A. viewed the Government’s decision to include other sporting bodies in the 1925 Tax agreement was merely a ‘vote catching device’ used by TD’s with constituents who followed those other games. By the time the 1927 Finance Act was passed the G.A.A. alone enjoyed this position of privilege. Clause 8 of the 1927 Finance Act exempted the ‘bodies established for the promotion of Gaelic football, hurling and handball’ from the payment of tax. In contrast to the government’s pro G.A.A. position on the matter the Labour Party thought that the advantage enjoyed by the G.A.A. in 1927 would, ‘create jealousies and antipathies in the world of sport’. Any jealousies would have been aggravated by the view of Martin Corry (F.F., West Cork) who suggested that, ‘the money received from taxation on Rugby and Association Football should be given as a subsidy to the Gaelic Athletic Association’. With views such as those, it might have been expected that the G.A.A. would enjoy an even more privileged position under a Fianna Fail administration. One-time President of the G.A.A. and Fianna Fáil TD, Seán McCarthy, was of the view the G.A.A. was a central component in the larger republican movement, which he described as, ‘a combination of the Gaelic League, the G.A.A., the I.R.A. and the Catholic Church’; indicating the G.A.A. was a central component in Fianna Fáil’s vision of, ‘Irish-Ireland’. On occasions close links between the two organisations were evident, for example in public commemorations. One such occasion saw, ‘members of the I.R.A., Cumann na mBan, Fianna Fáil, Gaelic League and G.A.A.’, together at a public rally celebrated the anniversary of the battle of Clonmult (an action in which 12 I.R.A. Volunteers were killed in 1921) At the 1934 G.A.A. Congress in its jubilee year, Eamon de Valera, though primarily an avid rugby fan, paid high tribute to the work and members of the organisation. It was public commemorations and declarations such as these which led Eoin O’Duffy, who had his own political axe to grind, to declare that the G.A.A. was now, ‘in many places becoming the tool of a political party. It is being prostituted for politics’. It would of course be wrong to suggest that the relationship of the Association and Fianna Fáil was one without strife; some leading members of Fianna Fáil would later prove to be just as unsympathetic to the Association as Cumann na nGaedheal members had been. The Association at times did not endear itself to some members of Fianna Fáil, especially in relation to its stance on the ban on foreign games, which will be addressed below. 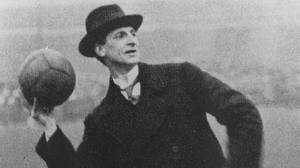 Eamon de Valera throws in the ball at Croke Park. Shortage of money was one of the G.A.A.’s problems for much of the 1920s. However, by 1926 the Association had a credit balance of £5,750. The Association’s income was calculated at £8,666; £7,900; £15,500; £9,300 and £12,200 over the years 1929-1933, and at the 1933 Annual Congress it was stated that, ‘the financial position was sounder than ever’. Participating in and watching sport had become an important part of Irish life and this resulted in G.A.A. finals attendances rising generally from under 2,000 in the late 1920s to 70,000 in 1938. It can be argued that the Association achieved a new confidence brought about by increased financial stability and popularity, as well as a sense of its own history, which elevated it to a level where it felt it could confidently voice its opinions on matters of State policy. Attendances at GAA final matches rose from 2,000 in the early 1920s to 70,000 by the end of the 1930s. In a G.A.A. produced pamphlet entitled National Action in 1942 it did exactly that, controversially claiming that the government structures of the State were, ‘unsound’ and hinted that it was in favour of the dismantling of the State’s political structures. However, it must be remembered that Association viewed itself as a national body and therefore above party politics so criticism of government was not necessarily meant to favour one party over another. In pre-independence years the Catholic Church helped the G.A.A. make inroads into the education system by taking its games into schools. On this basis it may have been safe to assume then that once independence was secured that the G.A.A.’s influence within schools would be consolidated. Since a large number of people in Irish politics came from a G.A.A. background, many in the public sphere of Irish Free State, it is argued, viewed sport as an extension of the educational process and as a means of building character and national identity’. However, this view may be called into question. It was only in the late 1920s and early 1930s that the State began to show interest in the development of physical education and in May 1933 the Department of Defence decided to investigate the training techniques of physical training in Germany, Czechoslovakia, France and Sweden and investigate the prospect of instructors from these countries to come to Ireland, with the view of expanding the system into state schools. An Irish Free State Army advert appeared just over a year later in June 1934 seemingly confirming this by stating that, ‘it is likely that it (the Czecho-Slovak training regime) will afterwards be introduced into schools throughout the Free State’. This incensed some G.A.A. supporters who exclaimed that its introduction would be the, ‘systematic and wholesale plan of foreign importation’, and that the regime ‘does not suit our needs, still less our traditions’. This was a precursor to another episode in which the Association became incensed at Government plans for physical instruction in the State’s Armed Forces. In the early 1940s Minister for Defence and soccer enthusiast, Oscar Traynor opened up the army to sports other than Gaelic Games. Unsurprisingly, this did not sit well with G.A.A. enthusiasts. The Association’s President claimed this was, ‘a retrograde step’ and that, ‘they were entitled to the same treatment for Gaelic games as they had for the past 20 years’. Sean McCarthy of the Cork G.A.A. board suggested ‘that the Gaels must make a stand’ and suggested that, ‘references by Archbishop Croke to Gaelic Games should be sent to Mr. de Valera and the head of the Army’, while Patrick Mullaney of the Mayo board called upon Gaels in the security forces to ‘inform soldiers that they detested the action of the new army body’. The favourable promotion of Gaelic games over those past 20 years in the Irish security services is evident in recruitment posters from the late 1920s which featured a photograph of recruits playing Gaelic games and giving enlistment incentives by emphasising the opportunities to play Gaelic football and hurling. It appeared that the fostering of Gaelic games within the army was of the utmost importance to the G.A.A., however it wasn’t deemed so important as to grant an army team admission to all-Ireland competitions. In 1924 the All Ireland Congress of the Association produced a petition to include the National Army as a province of the G.A.A., but this was firmly defeated, indicating that the G.A.A. was enthusiastic about Gaelic games in the armed services but only on terms favourable to them. However, this was most likely an attempt not to inflame the still-strong civil war feelings, especially among republicans who had fought against army members. Throughout much of its history, the G.A.A. had imposed a ban on members attending ‘foreign games’, such as soccer and rugby. Initially introduced in the early days of the Association it was suspended briefly between the years of 1897-1901. The implementation of this ban had previously caused some divisions among members of the Association, however it generated the most controversy in 1938 when the Association removed Douglas Hyde, then President of Ireland, as a Patron of the Association for his attendance at an international soccer match on 13 November in his duties as President. At a meeting of the Central Council on 17 December 1938 it was decided to remove Dr. Hyde as Patron for violation of that particular rule. For Hyde, this expulsion from an organisation founded by his long-term friend Michael Cusack and for whom Hyde had written the G.A.A. anthem The Marching Song of the Gaelic Athletes, was, ‘exceedingly distressing’. Hyde’s Presidential Office was aware long before the Central Council meeting of 17 December, that there could be potential repercussions from the G.A.A. due to his attendance at the game. Just over a year previously, the Taoiseach, Eamon De Valera received correspondence from the General Secretary of the Association informing him of a request made to G.A.A. Central Council ‘to make a vigorous protest’, at Mr. De Valera’s decision to receive representatives of the Yugoslav Association Football team at Government Buildings. Therefore it was clear that the G.A.A. was not afraid to challenge the highest authorities over their rules should the necessity arise. Regardless of the expected outcome of the Central Council’s decision, de Valera, who had also attended the game, was furious when he heard of the Council’s decision. Sympathy and regret were expressed over this episode within some circles. The Rev. P. J. Canon O’Beirne condemned the actions as, ‘an extremely short-sighted policy’, and Archdeacon Slattery of Nenagh was strong in his criticism of the actions and hoped the ban would ‘be wiped off the slate as far as Gaels are concerned’. Members of the public were also outraged in letters which appeared in the press which described it as ‘a shameful motion’. Another called into question the Association’s own patriotism: ‘Dr. Hyde has done more to re-build the Irish nation than those who are perpetually gassing about Irish games and Irish dances, and know next to nothing about the Gaelic Language and Gaelic literature’. Despite the outcry about the decision, on 9 April 1939 the annual Congress of the Association affirmed the decision of the Central Council in removing the name of Hyde as Patron of the Association ‘by an overwhelming majority’. Some commentators were of the opinion that the episode had left the G.A.A. in a position where it was an embarrassment to a, ‘new’ Ireland, and to the Fianna Fáil administration despite any links it had with the Association. The State had for the first time a new constitution, devised solely by a native government, which gave the state a new beginning and the banning of Dr. Hyde may have been seen as a throwback to a colonial period where such a ban was deemed more necessary. The Hyde incident certainly strained relations between the Association and the government and when Hyde’s successor as president, Sean T. O’Kelly, was inaugurated, a meeting took place between the Association and de Valera to ensure that the incident would not be repeated. As the new state was emerging from the bitter civil war it was necessary for both the government and the G.A.A. to reinforce alliances to promote as much stability as possible. The G.A.A., in a weakened financial position, needed the help of Cumann na nGaedheal to survive. While to a lesser extent, Cumann na nGaedheal needed the cooperation of the G.A.A. to play its part in helping promote the new State on the world stage with the Tailteann Games. The Association also appeared to be politically divided for a time with some County boards being under the control of anti-Treaty personalities while Central Council figures being in favoured the Treaty. As the 1930s progessed, the Association was in a better financial position than ever, the divisions of the civil war, although not yet forgotten, were not as raw as they once were. The G.A.A. could claim some credit in respect to this with efforts made to bring opposing factions together through sport, and there was a degree of normalisation of politics with the emergence of Fianna Fáil. This contributed to a more confident and more vibrant organisation. It can be argued that while the G.A.A. was more closely linked with the political establishment than other sporting organisations, the Association perhaps believed it was due a more favourable position in the state than it was actually given. To a certain extent elements within the Association believed it was above the level of sporting body and had a right to have a say in political matters, for example, the criticisms of the Department of Defence for choosing a foreign training regime. On occasion it even believed itself to be above party politics, with the publication of National Action and the decision to publicly reprimand the serving Irish President. The Gaelic Athletic Association, like the Gaelic League had found itself in a similar position at the birth of the Irish Free Sate as it had in pre-independence years. Both organisations were still agitating for the favourable treatment from the Government, the difference being that they were engaging with people who purportedly held the same ideals as they did. Initially both movements were reliant upon the native Government for financial aid to see their areas of interest flourish. However, as the G.A.A. became stabilised it thrived in popularity and therefore did not rely on the government as much as the Gaelic League. The native governments created an environment where Gaelic sports and the Gaelic language could prosper in a way which was not possible before. By the mid 1940s the G.A.A. had consolidated its position as the number one sporting activity in Ireland. From its relatively weakened position under the last months of the British administration, in post-independent Ireland it flourished and played a more prominent role in Irish life than the Gaelic League achieved. Sport, especially Gaelic games had become an important part of everyday life and the parish-based structure to those games continued to be popular among Irish people. While there continued to be overlaps in membership between the G.A.A., the Gaelic League and political parties both organisations influence on political matters was minimal. The Association’s relationship with those in Government had certainly been strained at times, but it was firmly part of the Irish-Ireland project favoured by the governing party of Fianna Fáil. M. De Burca, Gaelic Games in Leinster (Dublin, 1984), p. 22. W.F. Mandle, The Gaelic Athletic Association & Irish Nationalist Politics 1884-1924 (Dublin, 1987), p 194. De Burca, The G.A.A., pp 157-158. Mandle, The Gaelic Athletic Association, p. 202. B. Hanley, Irish Republican Attitudes to Sport since 1921, in D. McAnallen et al The Evolution of the G.A.A. : Ulaidh, Eire agus Eile (Armagh 2009) p. 177. R.V. Comerford, Ireland (London, 2003), p. 223. Hanley, The Evolution of the G.A.A., p. 177. D. Keogh, Twentieth Century Ireland (Dublin, 2005), p. 35. G. O Tuathaigh, The G.A.A. as a Force in Irish Society, in in M. Cronin et al, The Gaelic Athletic Association 1884-2009 (Dublin, 2009), p. 240. F. McGarry, Eoin O’ Duffy A Self Made Hero (Oxford, 2005), p. 150. Garda Síochána Annual Sports (Dublin,1925), p. 10. F. McGarry, Eoin O’ Duffy, p. 150. Report of Special Meeting of the Central Council, G.A.A. April 30 1927 (G.A.A./CC/01/03). M. De Burca, The G.A.A: A History, p. 165. De Burca, The G.A.A. p. 138. Irish Independent, May 23, 1927, p. 10. Irish Independent, July 3, 1931, p. 7. D. Walsh, The Party: Inside Fianna Fáil (Dublin, 1986), p. 34. Irish Independent, February 25, 1935, p. 10. Irish Press Supplement, G.A.A. Golden Jubilee 1884-1934. Irish Press, October 12, 1933, p. 7. De Burca, G.A.A., p. 139. Ibid, p.190 (Surpluses over expenditure for those years: £1,660; £1,250, £7,500; £2,000 and £1,200). P. Puirseal, The G.A.A. in its Time (Dublin, 1982), p. 221. D. Johnson, The Interwar Economy in Ireland (Dublin, 1989), p. 42. J. Anelius, National Action – a Plan for the National Recovery of Ireland (Dublin, 1942), ix. Mandle, The Gaelic Athletic Association, p. 133. Keogh, Twentieth Century Ireland, p. 34. The Catholic Bulletin And Book Review, Vol. XXIV, July 1934, No. 7, p. 579. Anglo-Celt, May 1, 1943, p. 13. Irish Army Recruitment Poster: Tower Museum, Derry City. P. O’Neill, Twenty Years of the G.A.A. : 1910-1930, (Kilkenny, 1931), p. 232. “Rule 27“. This rule banned all G.A.A. members from taking part in non-Gaelic games. It also banned them from watching any of those games or furthering their cause. J. Dunleavy & G. Dunleavy, Douglas Hyde: A Maker of Modern Ireland (California, 1991), pp 402-403. C. Moore, An Astounding Moment of Aberration: The Removal of Dr. Douglas Hyde as Patron of the G.A.A., (Dublin, 2010), p. 16. Irish Press, April 3, 1937, p. 9. Dunleavy, Douglas Hyde, p. 403. Irish Press, December 20, 1938, p. 1. Nenagh Guardian, January 21, 1939, p. 4. Irish Independent, January 17, 1939, p.12. Irish Independent, January 21, 1939, p. 10. Munster Express, April 14, 1939, p. 3 (the vote was carried by 120 to 11, with 5 members abstaining). Moore, An Astounding Moment of Aberration, p. 38. Written by: Barry Sheppard on 21 August, 2012. Last revised by: Publisher30 August, 2012.